At 2.6oz (75 grams) and 2.25 inches square (6cm) the SGI 4GE7MCM is a beast of a graphics chip. More properly called a Geometry Engine was, the GE7 was responsible for all the graphics processing in SGI Indigo2 workstations. The Indigo2 Extreme graphics option consisted of a pair of these MCMs (Multi-Chip-Module). Each one contains 4 GE7 Geometry Engines providing 32MFLOPS of performance each. Each GE7 consists of a custom 80,000 gate array from LSI (for a total of 320,000 gates and 128MFLOPS per MCM). This performance level was, ironically, better then the main system CPU (35MFLOPs for the 200MHz R4400 option). 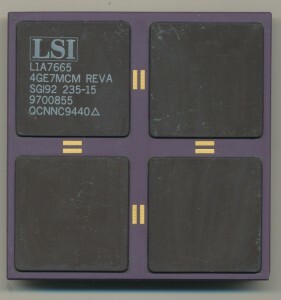 Each of the black ‘caps’ on the chip covers a single GE7 Engine. A similar design was used for the XZ Graphics system that had only 4 total GE7 cores. This was either implemented with 2 of the large MCMs that had only 2 GE7s in them (same package however) that were marked 2GE7MCM, or, later, a single surface mount MCM containing 4 GE7 engines. All were manufactured by LSI. In total the Extreme Graphics subsystem had no less then 31 custom gate arrays from LSI for a total of over 1.2 million gates. At an average of 2 transistors per gate that works out to around 2.5 million transistors, a considerable amount for a graphics system in 1993. Today’s graphics chips pack in transistors numbering in the billions, the Geforce GTX 680 has a total of 3.54 billion transistors, and performance measured in TFLOPS, again for the GTX 680, 3.09TFLOPS. Today’s graphics chips cannot, however, compete with the magnificent looks of the GE7’s giant MCM package. A little bit of trivia from my SGI days. The GE models had odd numbers for desktop systems, and even numbers for high-end systems. So the GE7 was in the Indigo series and was integrated as a chip, while the GE10 was a board on the Onyx systems (and used i860’s). It worked in reverse for the CPU boards. IP (Inhouse Processor) numbers were odd for high-end systems, and even for desktop systems. The Indy had an IP24, while the Onyx/Power Challenge had an IP19. There were regularly gaps in the numbering, which typically represented abandoned projects. The IP21, from memory, was a cost reduced IP19 with an on-board I/O processor, which was abandoned very late in development. You also would see SGI leapfrog engineering approaches across generations, initially seeking a custom solution, then accepting the industry standard solution (which had become good enough) for their next generation, then leaping back to a custom solution. For example, the IP12 and 4D/35 used these cool custom SIMM modules with on-PCB memory controllers. The next generation (IP20) used standard 72-pin SIMs. The back to custom memory modules for the O2/Octane. SGI was the most amazing engineering company I ever saw, and as it was my first company out of university, I thought it was typical. It wasn’t. Sadly, it’s management didn’t match it’s engineering. Very useful info, thank you much. Its sad that SGI’s management wasn’t near as good as its engineers. Though I have seen companies fail because the engineers try to be managers, which can be problematic too. SGI was a company where many engineers became managers. Whether this was a good or a bad thing is hard to judge: SGI found itself in the right place at the right time, and whether that was a happy accident or good management in the 90’s is an open question to many people. I tend to favor that it was a bit of both. Notably, this individual killed BEAST and ALIEN, both extreme high-end MIPS processors, in favor of Itanium, which he believed would rule the world. Yeah, that turned out well. 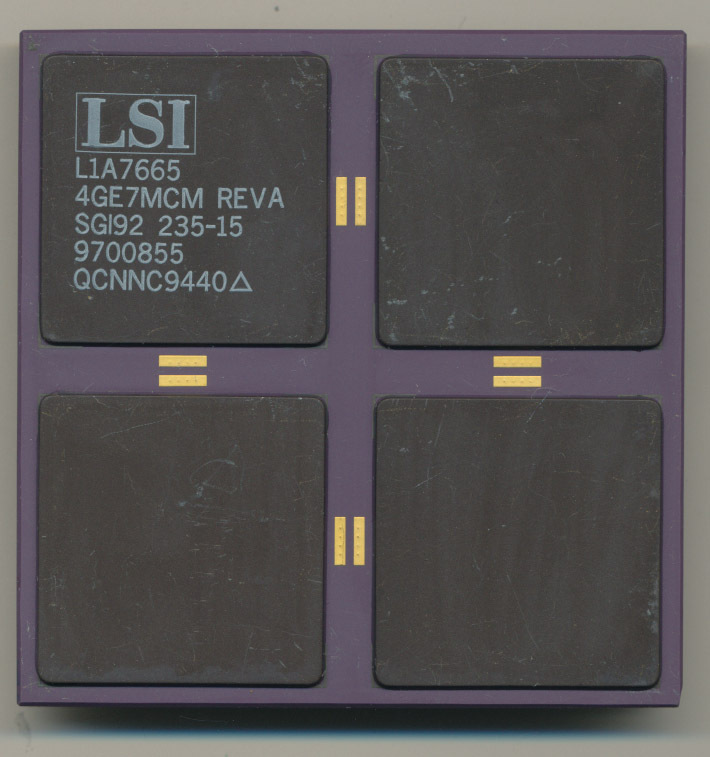 “2GE7MCM” (“L1A7786 2GE7MCM REVA”… that’s mine one) – so it is also graphics processor but another model? or we don’t know what type of integrated circuit it is? thanks.